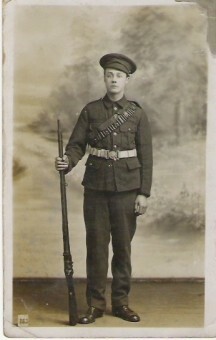 James Alfred Horrobin, this is a 'posed' photograph, taken at the age of 15, to show his Mother what he would look like in uniform! He signed up a year later at 16. My story is going to be a work in progress - it is a sort of story about a story. Where do I start? 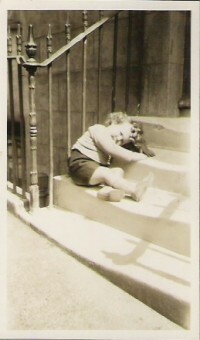 With my Dad, I think, who was George Horrobin. He has left me quite a legacy, made up of a large collection of photographs, 200 or so letters home from Bagdad, the start of a family tree and little leather suitcases of mixed ephemera. This is going to involve quite a lot of detective work. For example I have just found a photograph of my grandfather in military uniform and I recognised the belt as one of my ephemera items! 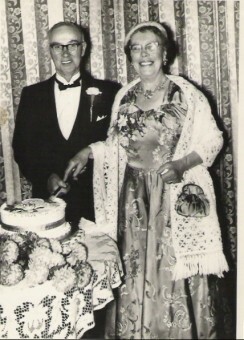 I also have a lovely shot of my Mum's parents at their golden wedding anniversary - I have her beautiful veiled and sequinned hat in my loft. 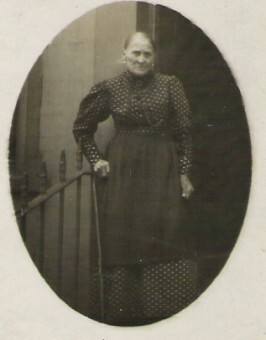 There is an old photo of a lady that I think is my great grandmother, I think I can confirm this now, as the photo of my Dad as a youngster on the steps of our house in Upper Market Street shows the same railings. The hairs on the back of my neck stand up with every new discovery, every new piece in the jigsaw. The family tree information is another story! It is totally addictive, so think carefully before you go down this road. I have now entered approx 400 family members into a family tree programme, searched for and downloaded over 20 census pages with really useful details to take the searches forward. We also have 5 christening robes from the Clayton family and a pretty little printed handsewn dress and 2 capes that my Great, Great Grandpa Daniel Edward Clayton wore at the age of 3! There will be another instalment to this story soon! This page was added on 26/05/2006.